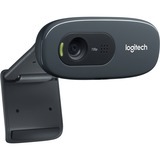 HD 720p webcam provides simple video calling on most major instant messaging applications. Built-in mic with noise reduction gives you clear conversations without annoying background noise. Even if you make a video call in dim or poorly backlit settings, the automatic light correction will intuitively adjust to produce the best possible image. Fluid Crystal technology provides smoother videos, sharper pictures, richer colors and clearer sound in real-world conditions. Instant messaging compatibility works with Skype, Windows Live Messenger, Yahoo Messenger and more.